At the Adler, kids don’t just learn about science—they do science. They program robots and write computer code, design experiments and launch them into space. The Adler is one of the nation’s only planeteria with an active research department. Our astronomers study exoplanets, black holes, the formation of stars, and the near-Earth objects whizzing past our planet. The Adler is home to The Webster Institute for the History of Astronomy which houses one of the world’s most valuable collections of historic scientific instruments, rare books, celestial maps, and other significant artifacts and gives visitors a tangible connection to space science. Through partnerships with schools, libraries, and other community organizations, Adler scientists and educators bring STEM programming to the public in Chicago and beyond. 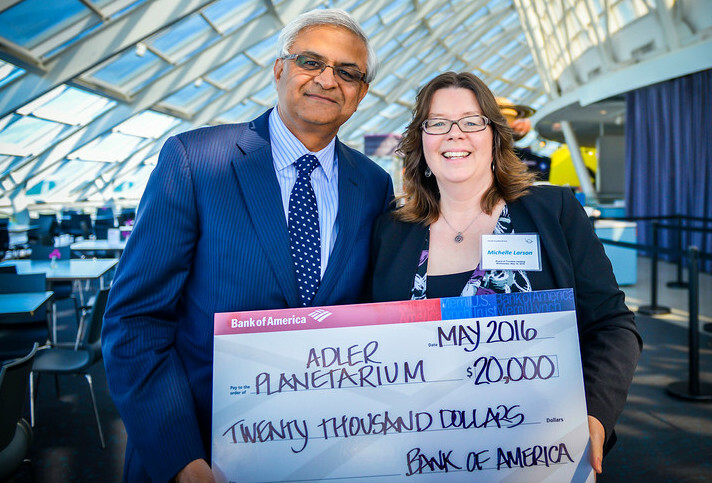 For more information about corporate opportunities at the Adler Planetarium, please contact our Development Office. United Financial of Illinois, Inc.
J.H. Ellwood & Associates, Inc.
*Employees of companies with asterisks next to their business name may enjoy special access to the Adler Planetarium. Please call 312.322.0514 to learn more about your company’s specific museum admission benefits.